Sergei Shamba, former so-called prime minister of Georgia’s occupied region of Abkhazia, said in an interview with Ekho Moskvy that Georgia and Abkhazia might launch a dialogue. “I do not think Georgians are our enemies; I have many friends in Georgia. Yes, we had an ethnic conflict, but it was largely a political conflict,“ he said. Shamba claims that he was the leader of the conflict with Georgia. “But I also was the first one who started talking about dialogue and thinking about the common future. We are, and it is our destiny to be neighbors. There have always been wars between neighboring nations, even in Europe. However, the relationship after any conflict needs to be managed. In my opinion, it is possible to start a dialogue with Georgia," Shamba said. Shamba also said that the "recognition of Abkhazia by Russia is the solution to all issues of Abkhazia." "Big Russia is the whole world for little Abkhazia. We can solve our security and economic development with Russian support and acceptance because Russia can offer not only its markets but also economic aid. Russia is the whole world for us," said Sergei Shamba. "There were a lot of investments in Adjara. The whole world wanted to help Georgia: Europe, the US. They are still interested in investing in Georgia, while we are focused only on potential Russian investments. " 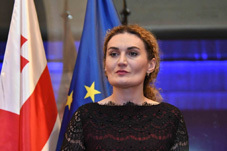 Georgian Minister for Reconciliation and Civil Equality Ketevan Tsikhelashvili stated that Georgia has a peaceful approach to the settling of conflicts and the country is open to speaking with Abkhazians and Ossetians. The War in Abkhazia from 1992 to 1993 was fought between Georgian government forces for the most part, and Abkhaz separatist forces, Soviet Russian government armed forces and North Caucasian militants. Ethnic Georgians who lived in Abkhazia fought mostly on the side of Georgian government forces. Ethnic Armenians and Russians within Abkhazia's population largely supported the Abkhazians, and many fought on their side. The separatists received support from thousands of North Caucasus and Cossack militants and the Russian Federation forces stationed in and near Abkhazia. The handling of this conflict was aggravated by the civil strife in Georgia proper (between the supporters of the ousted Georgian president, Zviad Gamsakhurdia – in office 1991–1992 – and the post-coup government headed by Eduard Shevardnadze) as well as by the Georgian–Ossetian conflict of 1989 onwards. Significant human-rights violations and atrocities were reported on all sides, peaking in the aftermath of the Abkhaz capture of Sukhumi on 27 September 1993, which (according to the Organization for Security and Co-operation in Europe) was followed by a large-scale campaign of ethnic cleansing against the ethnic Georgian population. A fact-finding mission dispatched by the UN Secretary-General in October 1993 reported numerous and severe human rights violations committed both by Abkhazians and by Georgians. From 13,000 to 20,000 ethnic Georgians and approximately 3,000 Abkhaz have been reported killed, more than 250,000 Georgians became internally displaced, or refugees and 2,000 are considered missing.